The dead or hypoxic zone marks an area in which the oxygen content in the bottom layer of the ocean drops, making it uninhabitable. The once teeming Gulf floor now is covered with a smelly, blackish-grey “goo,” another researcher said. The impact on human life is also real. The most problematic component in that “sewer’ is nitrogen from fertilizer. Iowa and Illinois alone dump about 35 percent of the nitrogen that arrives in the Gulf, according to the U.S. Geological Survey. 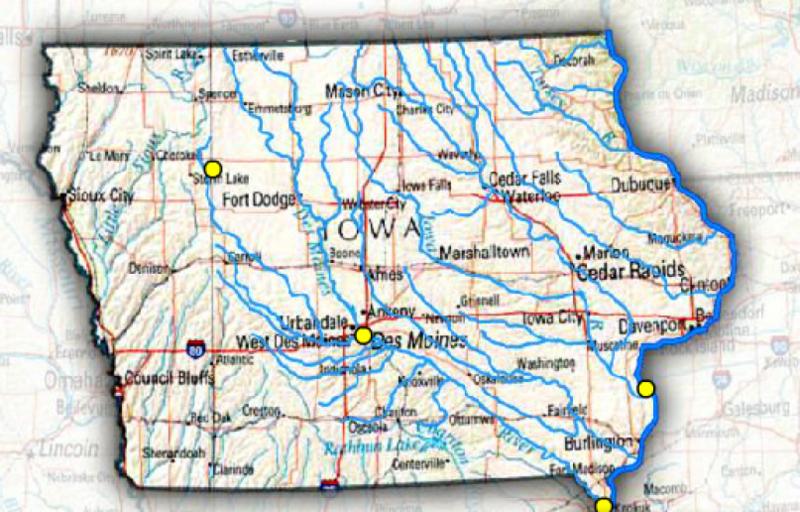 Another study says Iowa contributes up to 25 percent of the nitrogen to the gulf. In total, Illinois, Iowa, Indiana, Missouri, Arkansas, Kentucky, Tennessee, Ohio and Mississippi share responsibility for 75 percent of the nitrogen in the gulf. Environmental organizations across the nation, including the Iowa Environmental Council, have joined together in a petition against the EPA, released to the press on March 14. This petition argues that the EPA has failed to support the Clean Water Act with aggressive policies and standards, leading states to let water legislation fall by the wayside. There have been some efforts to address the nutrient runoff and its effect on the Gulf. In 2008, the Mississippi River Watershed Task Force created the Gulf Hypoxia Action Plan, calling for a reduction of the size of the dead zone by 2015. This would require a reduction of nitrogen runoff by 45 percent, a goal that most environmentalist and policy makers recognize as impossible. In 2010 alone, between 1.01 to1.26 metric tons emptied the Gulf Coast — over 70 percent of which flowed down the Mississippi River, the U.S. Geological Survey found. “That same mass of nitrogen would fill roughly 145,000 dump trucks,” said Aaron Gwinnup, a water resources engineer at HR Green. “This would be a line of bumper-to-bumper trucks stretching for 685 miles, about the distance from St. Louis to New Orleans.” In 2008, as a graduate research assistant at the University of Iowa, Gwinnup traveled to the gulf to measure the dead zone. Flooding, fertilizer and tiled farmlands. Despite advances in farming and the use of fertilizer, the amount of nitrogen flowing past the geological survey’s checkpoint in Clinton, Iowa, increased by approximately 76 percent from 1980 to 2008. The massive amount of nitrogen coming out of Iowa can seem puzzling. Why is Iowa so high on the list? The explanation involves a number of factors: the use of a system called tiling to remove water from land; planting row crops like corn, which require more fertilizer; and increased flooding. Susan Heathcote, the water program director for the Iowa Environmental Council, said central Iowa is the major contributor. Iowa’s tiling system emerged over 100 years ago, when farmers drained land to make it suitable for farming. 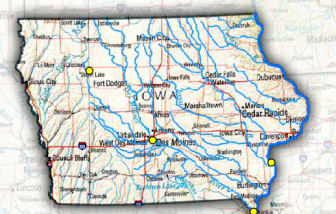 Over time, more than 90 percent of Iowa’s wetlands were drained. Of all the states along the Mississippi River, Iowa has lost the greatest percentage of wetlands. Heathcote described the tile system as similar to drainage around the foundation of a house. A perforated pipe is buried about three to four feet below the surface. The water enters the perforations and runs into a drainage ditch or stream. The main issue with tile drains is this capturing of nitrogen. Instead of passing through the natural filters of grasses and plants in a small streambed or wetland, nitrogen that enters the tile system goes straight to the waterways. However, the tile system is not irredeemable. In 2008, the year Gwinnup studied the dead zone, flooding wiped out Iowa homes and buildings on the University of Iowa campus. Although the floods were far removed from the Louisiana and Texas coasts — where the hypoxic zone is located — record amounts of nitrogen, swept from the soil by heavy rains and flooding, arrived in the Gulf. “It should, statistically, have been a record year,” Gwinnup said. He pointed to a 2008 map of the dead zone, composed of irregular edges that spread over 8,000 square miles until it was clipped off suddenly along the western border. “That was Hurricane Dolly,” he explained. Hurricanes, in a bizarre twist, diminish hypoxia by mixing up the water column, delivering oxygen to the suffocating creatures below. The size of the dead zone fluctuates every year, but averages about 6,400 square miles — about the size of the state of Hawaii, or three million football fields. One reason for the fluctuation is rainfall. Whenever the states surrounding the Mississippi River Basin experience heavy precipitation, more nitrogen leaches out of the soil and into the series of streams and rivers that eventually flow into the Mississippi. With the frequency of major flooding events increasing, policies and projects to reduce flooding acquire national importance. Such projects include building buffer strips, which consists of planting trees and grasses along rivers and streams, and restoring wetlands. Another way to limit the amount of nitrogen entering Iowa waters is to address the source: fertilizer. Although regulations exist to monitor and control the application of manure to fields, chemical fertilizers are not regulated. Currently, the only way to control the amount of fertilizer farmers apply is through volunteer programs. Nitrogen runoff is a nonpoint source pollution, which means that water runs over and through the landscape, picking up pollutants and depositing them in water. There is no specific origin for nonpoint pollution, so the federal Clean Water Act can’t regulate it. In recent months, there has been talk of expanding beyond current voluntary programs. The Department of Agriculture and Land Stewardship is developing a strategy to reduce nutrients from agriculture, which they plan to release in April or May. Meanwhile, the Department of Natural Resources is developing a strategy to reduce nutrients from cities and wastewater, Skopec said. Some have suggested encouraging farmers to apply fertilizer in the spring, but this runs into a tangle of logistical issues. “A few years ago, people didn’t finish bringing corn in until Christmas,” said Agronomist Vaughn Kinney recently based in Tipton, Iowa. “Everybody in the state ended up putting fertilizer on in the spring. It was almost impossible. There is just not enough equipment or manpower [to apply the fertilizer during the short spring window],” he explained. Additionally, fertilizer is often cheaper in the fall than in the spring, said Susan Heathcote, water program director for the Iowa Environmental Council. But, when farmers apply nutrients in the fall and Iowa suffers a wet spring, much of the chemicals applied are lost before the seeds even enter the ground. Nitrogen is lost through runoff, when water carries it off the field before it sinks into the soil, and through leaching, when heavy rains dissolve the water-soluble nitrogen and carry it through the tiles and into streams. From January through September of 2010, Iowa received more than 40 inches of precipitation. This is six inches more than the annual average, and higher than the 2008 values, which reached 36 inches. But sometimes this initially cheap price can turn expensive. During a wet spring, farmers who apply the proper amount of fertilizer in the fall lose so much of it through runoff that they often have to apply again, Heathcote said. Schmitt said that with the rains Iowa experienced in 2010, he had to go back in and reapply. “I had to have an airplane come and drop 50 pounds of nutrients,” he said. However, farmers who apply in the spring have a small window for applying fertilizer before planting. A wet spring means farmers might be unable to get out and work on the fields. If farmers apply in the fall “at least [they] know [they] got it on there, and if [they] lose some, well that’s just part of business,” Heathcote said. Some farmers might put down more during a fall application, just in case, she added. Schmitt, however, disagreed. He said there, “used to be an attitude of ‘I know I only need 150 pounds, but I’ll throw on 50 extra, just in case,’” but with the price of fertilizer, that is changing.“The best thing to happen, from an environmental standpoint, is high prices [for fertilizer],” he said. But even with high prices forming a market-based incentive to reduce fertilizer use, addressing the runoff problem is still complicated. Marvin Shirley, a farmer in Dallas County who has been farming for 50 years, said he puts down his fertilizer in the spring. However he said the use of spring application just isn’t feasible for larger farms with many acres to fertilize. He notes that a lot has changed in farming during the past 50 years, but said regulation of nitrogen was still unpopular among farmers. “Ten years ago, I thought that was a good way to equalize things,” Shirley said, adding that while one farmer might follow all the voluntary regulations, another farmer across the way can be irresponsible and cause soil erosion and runoff that effects everyone. “The big discussion in the farmer’s union is trying to put those restriction on farmer’s insurance. But that’s not going to go anywhere,” he said. Former Gov. Chet Culver said he would support a management plan. However, Gov. Terry Branstad, has said he would not support regulations, leaving the future use of chemical fertilizer up in the air — or more appropriately, in the water. Branstad did not respond to calls and emails requesting a comment. Right now, regulation does not seem “politically doable in Iowa,” Heathcote noted. Many others believe that, even if regulations were applied, they would not be effective. The problem with education and incentives, Schmitt said, is the long incubation period before people see the benefits. “It takes a while, and right now we are in the mindset that if I invest a dollar, I want a dollar back,” he said. Many farmers are already learning to spread fertilizer more efficiently. Kinney, the agronomist, noted that farmers can use GPS technology to apply fertilizer only where it is needed. He said more farmers use this technology now but change takes time. “The average farmer is about 55 years old and not very tech-driven,” he said. He said hypoxia is an issue for farmers, and if they were farming the same way as they were 20 years ago, the dead zone would probably be worse. Any solution to the issue of nitrogen must go beyond fertilizer, Skopec said. It must also address flooding, loss of topsoil, and the drainage system known as tile drains that turns Iowa’s formerly swampy lands into useable fields.